We’re surprised it’s taken so long. 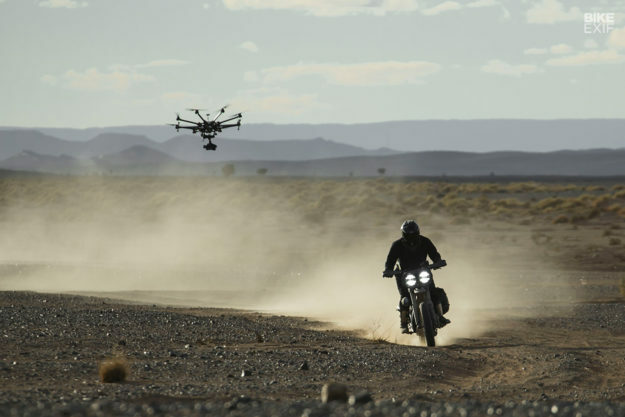 The ‘alt moto’ movement has been on fire for at least a decade, but it’s never made the jump onto the big screen. 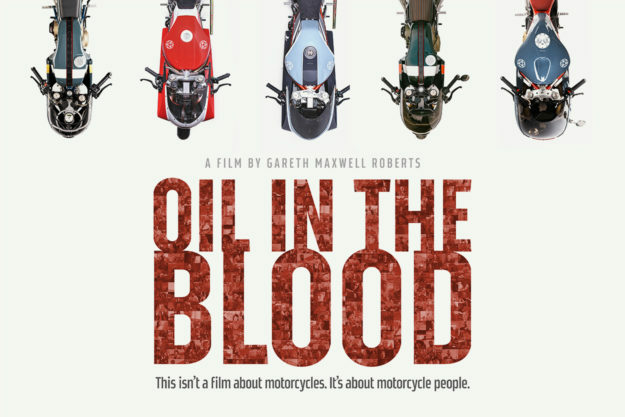 Oil In The Blood is the first film to catalog the builders, riders and artists who are driving the scene forward. It’s directed by Gareth Maxwell Roberts, a founding member of the Bike Shed club in London and the possessor of an unfeasibly large Rolodex. Gareth knows everybody in the business—and the cast list feels like a Who’s Who of the 21st century custom world. 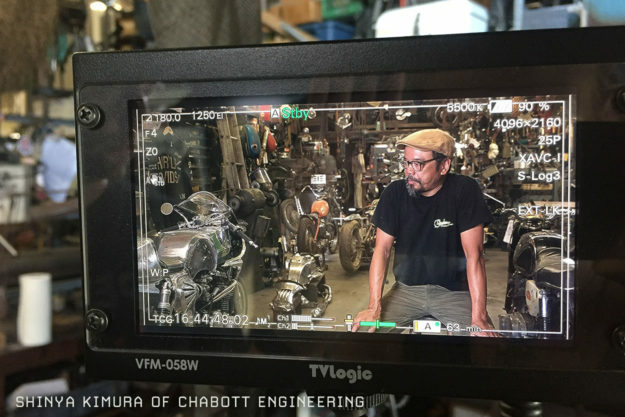 The film includes many of the world’s top builders, such as Ian Barry of Falcon, Max Hazan, Craig Rodsmith, Walt Siegl, Shinya Kimura, and Winston Yeh of Rough Crafts. Plus designers like Ola Stenegärd of Indian and Kurt Walter of Icon Motosports, and commentators like Paul ‘The Vintagent’ d’Orléans and yours truly. On a personal note: I’ve been following the progress of Oil In The Blood for three years now. 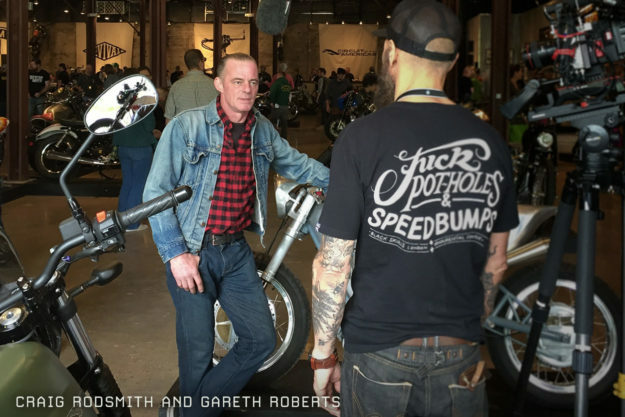 While I was on a trip to England for the Triumph Bonneville launch, Gareth coerced me into an interview lasting several hours. It was in the cozy, atmospheric Super Brick workshop, in a courtyard just off Brick Lane in East London. And last year, during yet another trip to the mother country, we covered even more ground in a second interview. So now it’s time to flip the tables and fire some questions back at Gareth Roberts himself (above). We grabbed him few hours after the film premiered at The One Moto Show in Portland. Bike EXIF How did you get the idea for Oil In The Blood? Gareth Roberts I started planning in late 2014. I was involved in the early years when the new wave custom scene was small and niche, and I witnessed it grow into a global phenomenon. I saw it expand and gestate, fuelled by a strange and intoxicating mixture—nostalgic analog values, and contemporary digital communications. 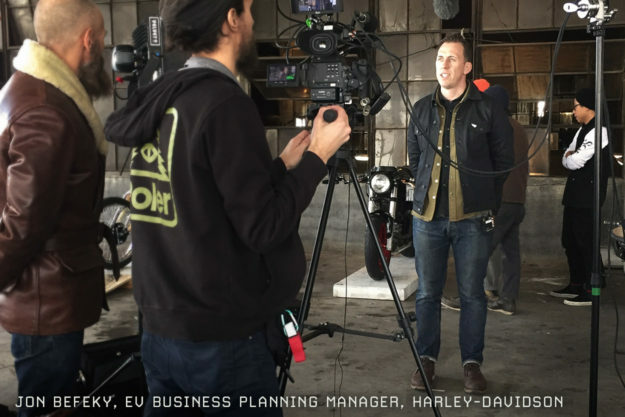 I felt we were living through a seismic shift in motorcycle culture, and that it needed to be documented. I wanted it to be an all-encompassing examination and a celebration; a story told by the very people at the heart of it. How many interviews did you conduct, in how many countries? Nearly three hundred interviews, in fourteen countries. Aside from you, who were the people who made this film happen? Producer Lucy Selwood, production manager Sophie Haines, cinematographers Josh Allen, Matt Broad and Andrew David Watson, and sound recordist Nick Walker. Who was your favorite interviewee? Hugh Mackie of Sixth Street Specials. He’s been building bikes since the early eighties and racing flat track since the early nineties. Indian Larry, Paul Cox, Keino Sasaki have all worked for him. He’s seen it all, and speaks with a beguiling mix of humorous cynicism and eternal optimism. 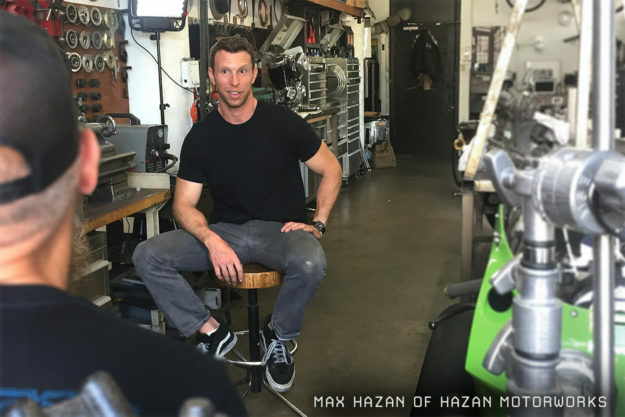 He epitomizes the soul of building motorcycles. What were the high points during the filming? 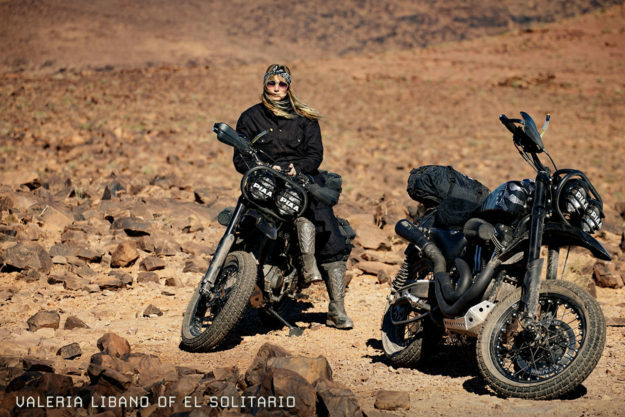 Being in the Sahara with El Solitario. On a frozen Wisconsin river filming Ryan Stephen of Freestyle Supermoto and his crew ice racing. Filming at Mama Tried, riding bikes with Gerald Harrison, and generally just hanging out with ‘Majik Mike’ Rabidau. And the low points? Running out of finance, and having to accept the fact that filming certain builders and events were beyond of our resources. Which builders do you admire the most? David Borras of El Solitario, Max Hazan, Ian Barry of Falcon, Cristian Sosa of Sosa Metalworks. 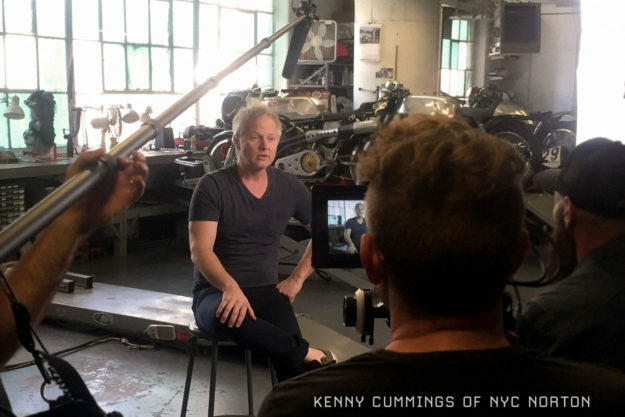 Kenny Cummings of NYC Norton, and Calum Pryce-Tidd of deBolex Engineering. 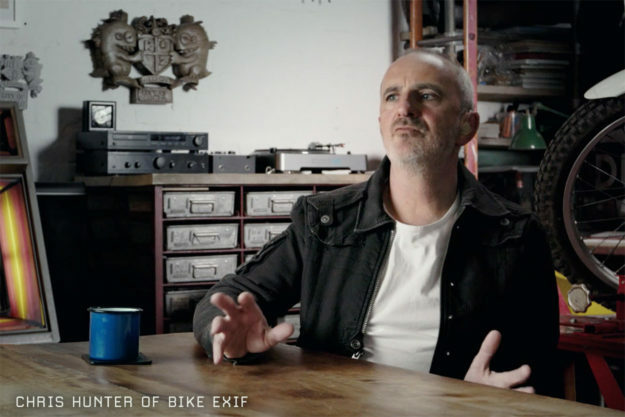 What’s your view on the future of custom bike building? The culture has matured. It’s no longer a ’new genre.’ The mainstream motorcycle industry staked a claim, and there’s been a split between those who embrace it and those who reject it. There’s certainly been a bedding-in process; most of those who have a stake in it have really burrowed into their own niches, both in work practice and style. With new technologies—electric and hydrogen fuel cells—there are new stimuli and challenges for those who embrace it. Those who don’t will delve deeper into vintage. 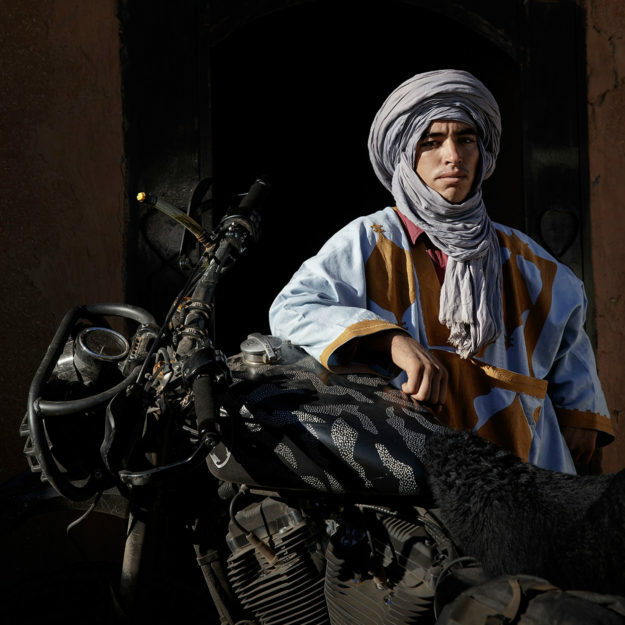 What is your personal motorcycling background? I’ve been fascinated by bikes for as long as I can remember. The first bike I can recall was a Norton Commando from when I was around six or seven years old. I started riding bikes when I was 14, on bikes borrowed from older friends and older brothers. When I was 16, having saved up from part time jobs, I bought a 1972 Vespa 50 Special. I was a Mod and loved old scooters. I subsequently had a string of pretty and very unreliable vintage scoots, culminating in the earliest bike I’ve ever owned, a 1957 Lambretta LD150. I then switched to two-stroke hooligan machines: a Yamaha RD250LC and a Suzuki PE250. 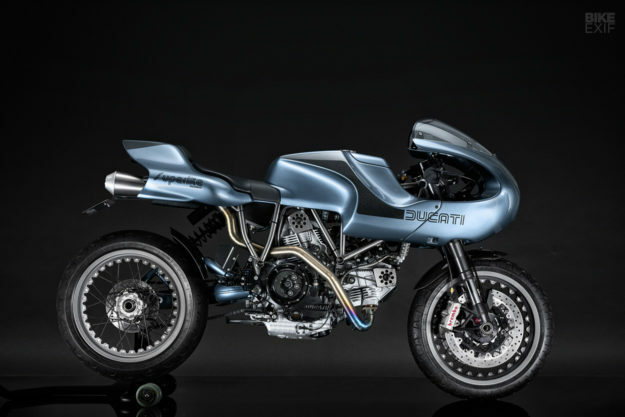 The nineties saw me on superbikes, the climax being a Ducati 916SP. I became something of a track day warrior, and in 1999 I took the plunge and started racing two-stroke 125 GPs, which are single purpose race bikes, on a Honda RS125 at club and national level. After couple of seasons on the most fun bike I’ve ridden, I went up a class to a RS250, the most frightening bike I’ve ridden. After a thoroughly unremarkable and hugely enjoyable three seasons of going very fast but not fast enough, and crashing more times than my bank balance allowed, I hung up my leathers. 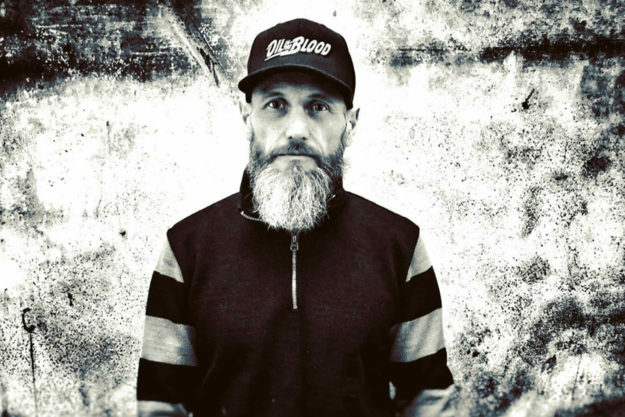 The transition from sports/race bikes, to custom bikes, was really a desire to slow down a bit: I felt I had ridden my luck on very fast bikes, and got away with it. After I finished racing, I didn’t have a bike for eighteen months, realized that wasn’t going to work, so I got a Husqvarna SM610 to ride about on. Not exactly a sedate commuter bike, it was certainly slower top end! I became interested in custom bikes when I saw a vintage Honda race bike on a trailer in a service station, and started looking online for one to convert to a road legal bike. Then I came across the very early Spirit of The Seventies website, and it took hold from there. What bikes are in your garage at the moment? A 1973 Norton Commando 850 Special, a 1979 Triumph T140 chop, a 2015 Yamaha XJR1300 custom by deBolex, the 2010 Ducati MH900 Superlite (above), a 1976 Bultaco Astro and a 1980 Moto Morini 500 Sport. Where can people see Oil In The Blood once it’s finished the rounds of the shows? We will have a commercial release later this year, on streaming and download-to-keep platforms, and possibly a limited theatrical release. 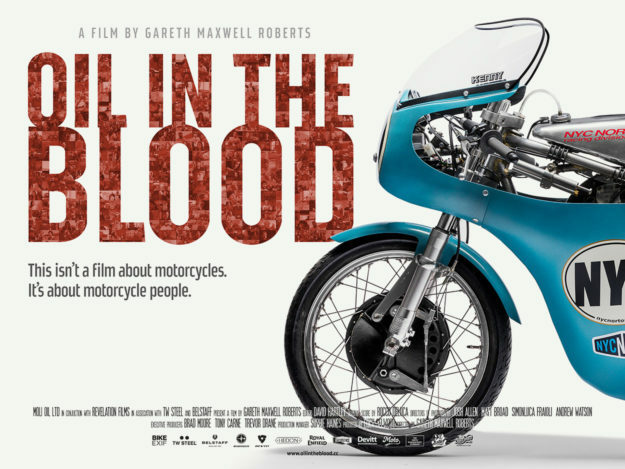 The response to Oil In The Blood after the showing at The One Moto Show has been phenomenal. If you’re in the US, catch it next at Mama Tried, then at Chicago’s Logan Theatre on February 21. On April 5 it’ll be shown at the Petersen Museum in LA (in conjunction with The Vintagent), with more dates to be announced soon. 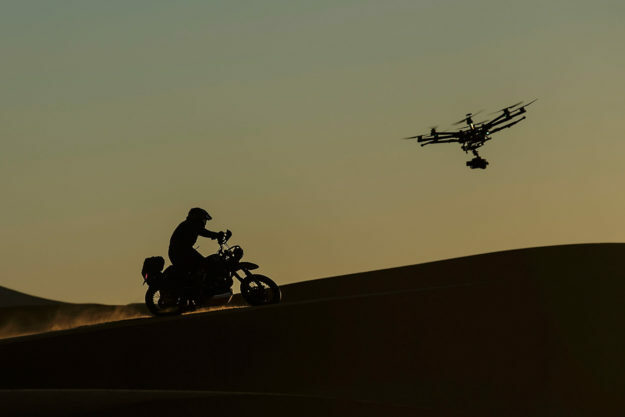 If you’re heading to a moto show or festival in spring or summer, keep your eyes peeled for a showing. We think you’ll like it.